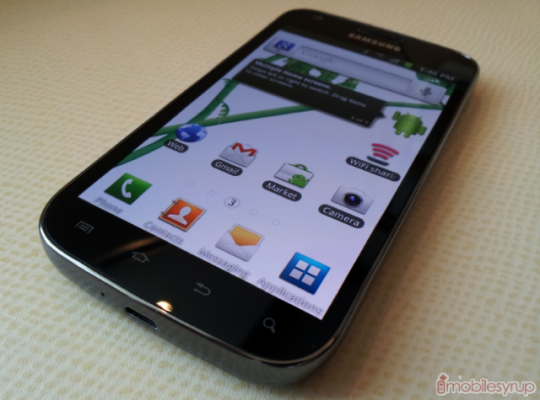 The Samsung Galaxy S II has been caught on video again and is out in the wild. This is being called the Galaxy S II X and is headed to TELUS. What you see in the pictures and video below is the same version that will hit the U.S on T-Mobile dubbed the Hercules. We’ve seen this bad boy back in August posing with some benchmarks and it’s safe to assume it will be headed to TELUS and T-Mobile USA here very soon — I can’t wait to get my hands on it. The Hercules is essentially the same version of the Galaxy S II as the others on US soil and features a bright and amazing 4.52″ AMOLED display, Android 2.3.5 Gingerbread, 8MP Camera and a few more amazingly awesome specs. The one thing that makes it different and potentially better than the rest — it will be powered by a 1.5 GHz dual-core processor compared to just 1.2 GHz with the others. The only difference we see here between the SGSIIX on TELUS and the T-Mobile Hercules is that latest pictures revealed the T-Mobile variant will have a brushed aluminum back cover rather than the usual Samsung plastic. Everything else remains the same with the 8MP camera, 2MP front, ports and that slim and sleek design. MobileSryup once again confirms the 1.5 GHz processor, NFC, and that huge 1850 mAh battery inside. Here are a few more pictures and the Hercules live on video looking pretty spectacular.